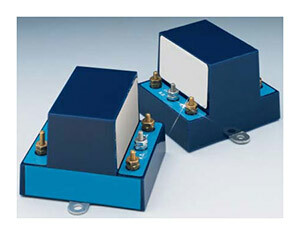 Less than 100 microamps at 14 Vdc actuates the unit to control ac loads to 5 amps at 120 Vac. Resistive (up to 400,000 ohms) or short-circuiting sensors operate the unit. 115 Vac and 230 Vac models. Momentary actuation, “start-stop” or differential control switching for resistive loads to 0.3 amps, 115 Vac model. OMEGA™ solid-state relays for intrinsic safety allow non-voltage producing switches mounted in the hazardous area to safely control higher power ac loads in the nonhazardous area. Typical applications include flow, level and pressure switches which may be inputs to an alarm or control system. Note 1: For typical wiring diagrams, see next page. Note 2: All ac voltage and current specifications are RMS values unless otherwise stated. Note 3: Housing material is Polysulfone.